TAW’s Potential US$2.5BN Revenue Liberian Iron Ore Project Poised for Development? Field teams from Tawana Resources NL (ASX:TAW) have found potential new Direct Shipping Ore (DSO) prospects at surface with grades of up to 66% Fe. 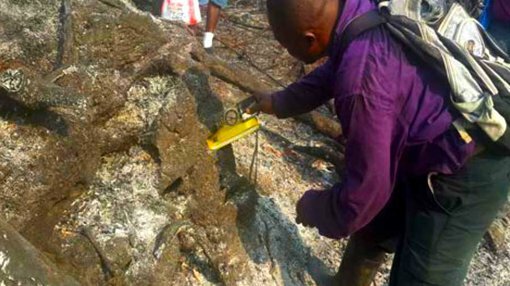 The discovery has been made at the company’s flagship Mofe Creek project in Liberia. TAW is working to bring a low cost 2.5Mtpa mine into production in Liberia that could generate an estimated US$2.5BN over a 14 year mine life, mining the “free-dig” DSO and coarse grained, high-grade itabirite mineralisation. Mofe Creek has a maiden resource at the Gofolo, Zaway and Koehnko deposits representative of friable itabirite equal to 62Mt at 33% Fe. Additionally, TAW is developing the Mofe Creek South exploration license, where the new DSO discovery, the Goehn deposit, has been made. This new find raises the possibility of significantly expanding the company’s current resource levels for both itabirite and DSO iron ore. The Mofe Creek project area is just 35km along strike from the abandoned Bomi Hills mine that produced 50Mt of DSO at a grade of 65% Fe. The possibility of TAW discovering its own DSO has been a significant motivator for the company’s exploration programme. TAW acquired 100% ownership over the Mofe Creek South Licence (MEL1223/14), late last year and recently engaged local field teams to conduct initial mapping and targeting of the tenement and to identify future areas of potential mineralization and future resource expansion. Results were quickly gathered and a new DSO and friable itabirite mineralisation potential was defined in outcrops over a combined 2.2km strike length. The DSO discovery had an average grade of 62.8.% Fe, all within 8km trucking distance of the Gofolo Main resource, and 5 km from the national highway, linking the tenements to the capital city of Monrovia (75km away). But the new Goehn discovery is highly significant for TAW because it contains a large portion of DSO – high grade iron ore that can be simply crushed, screened and transported to awaiting stockyards/ships. DSO produces a quality, marketable product with low operating costs, and in the case of the Goehn deposit, potentially very low capital start-up costs. The Goehn deposit incorporates DSO grades of up to 66% Fe across a 120m strike on the top of the deposit and is part of a 550m strike of combined DSO and coarse-grained itabirite mineralization. Other hills in the immediate vicinity of this deposit, incorporating additional coarse-grained friable itabirite mineralisation represent a potential strike length of greater than 4.5km. TAW’s CEO and Executive Chairman, Mr Wayne Richards, said finding DSO grade mineralisation at surface is a very encouraging result for the company. “This represents an exciting new opportunity and enhances the potential for further DSO discoveries within the tenement,” he said. With a new DSO prospect in hand, TAW has been awarded an Environmental Protection Agency permit to continue its widespread exploration within the Mofe Creek South exploration licence. This paves the way for future drilling and seismic survey programmes, and the company is expected to release details on this work soon that could firm up the promising results of its initial field work. 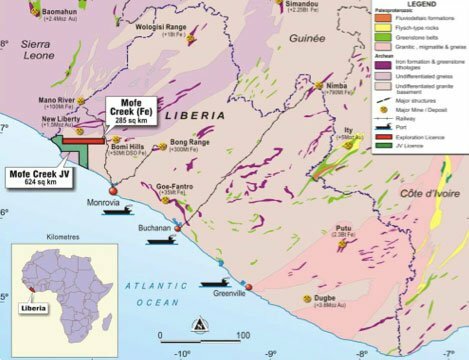 In addition, TAW has been granted an eight month extension, to the initial three year period, of both of its exploration licenses – MEL1223/14 and MEL12029 – as the result of an Ebola outbreak in 2014 and 2015. The incident was acknowledged as a Force Majeure event by Liberia’s government. Mofe Creek’s minerals are mainly coarse grained, high-grade itabirite that can be processed/beneficiated to produce a high-grade product of between 64% Fe and 68% Fe at a coarse crush sizing – an is in-demand product from steel producers worldwide. TAW’s goal is to commence production at a 1 Mtpa rate and grow the business to 2.5 Mtpa, initially mining the potential DSO, then funding future plant and logistics developments from cash flow and/or very limited debt. The Company’s strategy is to expand beyond 2.5Mtpa, as the Resource/Reserve is expanded and is developing plans to build modular and mobile beneficiation plant(s) that can be readily transported within the combined Mofe Creek Project area as each deposit is systematically mined. Mofe Creek is just 20km from the Liberian coast. This close proximity to a potential future transhipment port represents a very low CAPEX and OPEX business opportunity for the Project. In a major step forward for its production plans, TAW recently signed an MoU with WISCO CAD (Hong Kong) Mining Company Limited to negotiate a potential Cooperation Agreement for access to that company’s port facilities at Freeport, Monrovia. The MoU provides the framework to create an initial end-to-end logistics network for TAW that will allow it to export its DSO and/or high-grade itabirite iron ore products to the markets.